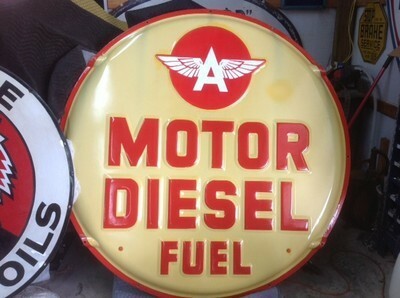 This Flying A Motor Deisel Fuel sign is round in shape and tan and red in color. The Flying A logo is positioned at the upper center of the sign. The logo appears withing a small red circle. Below the logo is the text that reads “Motor Deisel Fuel.” Around the outside boarder of the sign is a red boarder.